A good document of cisco which describes how to set the mtu and jumbo frame size on cisco switches. This is required mainly in service provider network when MPLS is implemented or customer which are coming on service provider network need more MTU sizes. I found a good document and would to share with you. Document explans the common problem which one commit during the lab. Layer 2 vpn is being used by many of service providers. It can be configure in two ways, one way to use l2 vpn over ip cloud with the help of l2tpv3 and another way is to use over mpls backbone by using encapsulation mpls. In this document I will be covering how to configure l2 mpls vpn over service provider cloud. Before moving ahead penultimate hop popping concept should be cleared. Generally customers look for the solution where the primary link is from MPLSVPN service provider and leased line or satellite is used as backup. In these scenarios most of the time customers usually use OSPF as routing protocol in their core as well as with service provider. The prime disadvantage of using as PE-CE routing protocol is that always the leased or satellite link will prefer. To overcome this problem sham link is used which is described in draft “OSPF as the PE/CE Protocol in BGP/MPLS VPNs”. So sham link is the best option. But what will happen if the same customer uses BGP as PE-CE routing protocol and OSPF is used by the secondary links. Which route will be preferred and why? Answer is simple always BGP route will be preferred because e-BGP learned has lower administrative distance than OSPF. Now think a case when the link from PE-CE flaps and e-BGP goes down. The traffic will flow from the secondary link with no pros and cons. After few minutes primary link from MPLSVPN service provider comes up and the traffic should flow via MPLSVPN service provider instead of back door. This is what we think but actually this won’t happen. The traffic will never move on to the MPLSVPN service provider and it will follow the secondary path. Actually what happens the routes which are redistributed from OSPF to BGP are having weight of 0 and the routes which are already in routing table have weight of 32768. So when the service provider link goes down in that case the remote end route which is coming via bgp will come by OSPF and redistribute in BGP. It means that route is having weight of 32768. Now the service provider link comes up and the same route comes by service provider cloud with weight of 0. So BGP will check the weight attribute and it checks the same route is coming by two different weights, one is 32768 and another with 0. So it will always prefer the weight 32768 consequence traffic will flow from the backdoor link instead of primary link. Set the weight 37775 at CE for the routes coming from service provider cloud. So during route installation time always the service provider route will be preferred. Yesterday during testing we found no show running config command on given IOS. May be a IOS bug or something else. From the last few days I am receiving lot of queries of implemetation of AutoRp and BSR in the core of service provider. The implemetation is really so easy but for that basic understatnding of multicast is required. I have already prepared the two low level documents of multicast which can help to implement it in a very easy manner with no errors. 1. Implementation of Auto-RP in service provider network. 2. Implementation of BSR in service provider network. The post is mainly focused on how one can push the technology in the new era to save lot of operational cost. Let’s envisage If Multicast push to deliver the new movies release in theatres. It really looks sound; the next time when you see the movie it will be on multicast. As per my design, all the theatres should have dedicated link across all the location with redundancy. The source should be the common place where actual movie will be started and rest of the theatres will be the receivers. One knows the power of multicast; the same stream will be replicated over millions of times with no extra bandwidth. With this companies can save lot of infrastructure cost. The day will come when this will be implemented. In my previous post of Untagged Lables Instead Of POP Labels depicts how loopbacks of /24 advertise in OSPF generate the untagged packets. In this post I will only explain how the benefit of command show mpls forwarding which help us to troubleshoot the problem within seconds. As per scenario given PE is attached to P router and advetising the labels for loopbacks only. At any time by mistake if some deletes the loopback acl what will happen? PE router will receive all the outgoing labels as untagged. So immediately without thinking anything you can run a single command "show mpls forwarding" and confirm there might be some problem with the upstream router. This troubleshooting is very basic for MPLS but really helps the operational guys to save lot of downtime. 1. 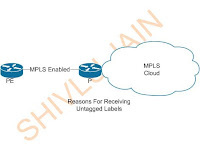 ACL is bind with "mpls ldp advertise label for MPLSVPN" but not created. 2. No acl is created and use the command "no mpls ldp advertise label for MPLSVPN". 3. Improper Authentication between or among the adjacent peers consequence untagged labels. 4. MP-BGP loopbacks advertise in OSPF without /32 subnet and without using ip ospf point-to-point network command. Real Time Scenario Problems:- I have seen many times when the LDP is working among the adjacent neighbors, at that time we receive the compaints that the customers from some backbone links are working and others are not. This is because of improper configuration where we missed to advertise the labels. The command mentioned above to help us troubleshoot such type of problems in a very ease manner.